Create a beautiful display of memories and mementos with this fantastic shadow box frame (8x10). The Reminisce shadow box allows you to showcase past events and keepsakes. Crafted to display quality and durability. The black wood frame offers a modern look suitable for any living space. By starting with the shadow box frame first, we've now allowed others to do the creative ticket, bottle cap, general mementos showcasing. Reminisce shadow boxes are quality-made picture frames. Each shadow box frame includes a top-loading opening on top. Shadow box with slot allows you to swiftly add collectibles to your collection. We ensure customer satisfaction because we appreciate displaying unique experiences and memories (in the form of tickets and other collectibles like sea shells). All Reminisce shadow box art wall décor comes with a 1 year warranty. Indulge in the recollection of past events with your new Reminisce shadow box frame. Use the top-loading shadow box frames to highlight favorite bottle caps, shells, ticket stubs, airline tickets, and more. The Reminisce shadow box has hanging hardware attached to the back for easy wall mounting. The Reminisce shadow box back also has a removable panel allowing you to place larger items inside. The Reminisce shadow box is 10 inches in height, 8 inches wide, and 1.8 inches deep. 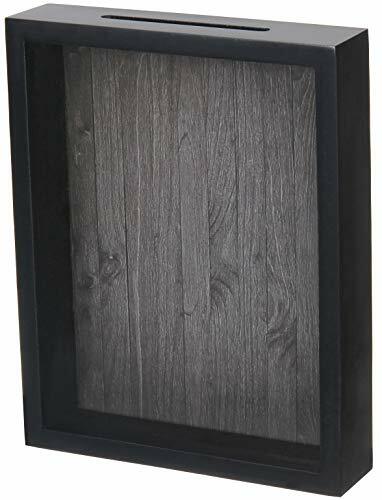 Create a beautiful and unique story-telling wall piece with the Reminisce ticket shadow box display case. Every Reminisce 8x10 shadow box display frame purchase comes with a one-year hassle-free warranty. If you have any questions about this product by Upstreet, contact us by completing and submitting the form below. If you are looking for a specif part number, please include it with your message.